A new BRAMS station has been set up in Seneffe. 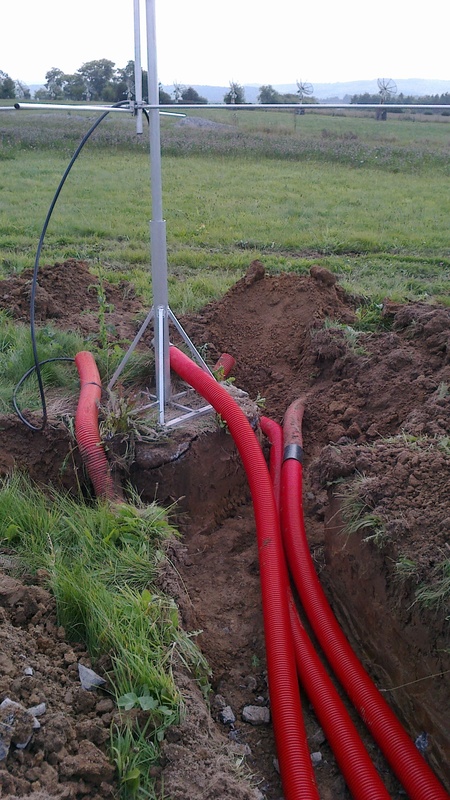 Thanks to David Erzeel and Patrick Mertens for taking care of the local installation. Thanks to IBPT for hosting the station. Finally, works in Humain have re-started again. 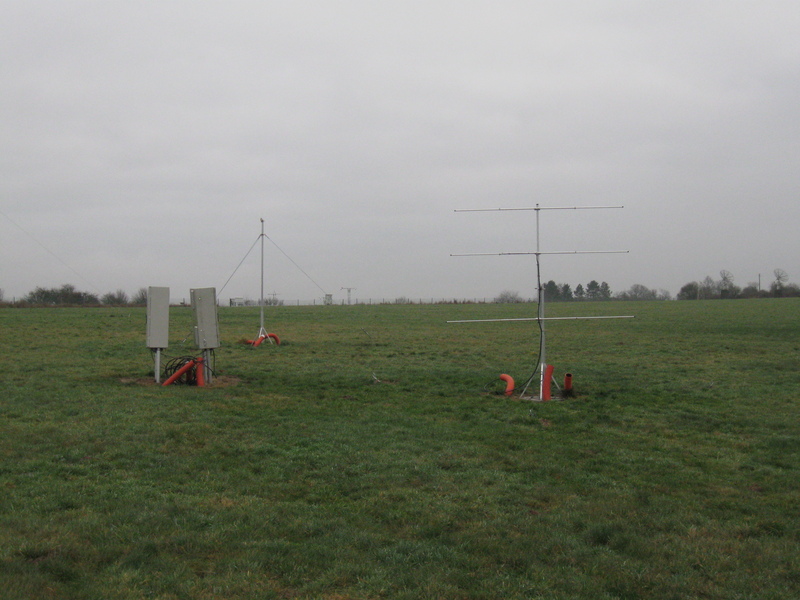 The tranches have been done and cables will soon be added to connect the 5 antennas to the receivers which will now be located in a small container (instead of a much smaller box as was planned before). The container can be seen in one of the images below. 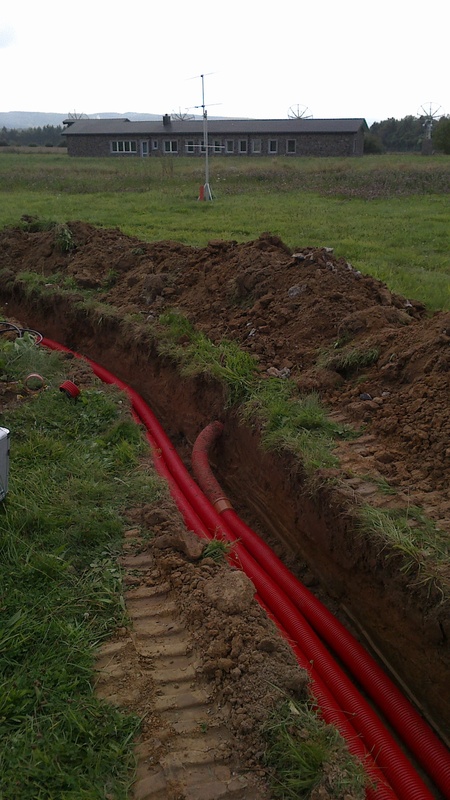 Next step is to install electrical power and internet access through an optical fiber and we will be able to start the initial tests. 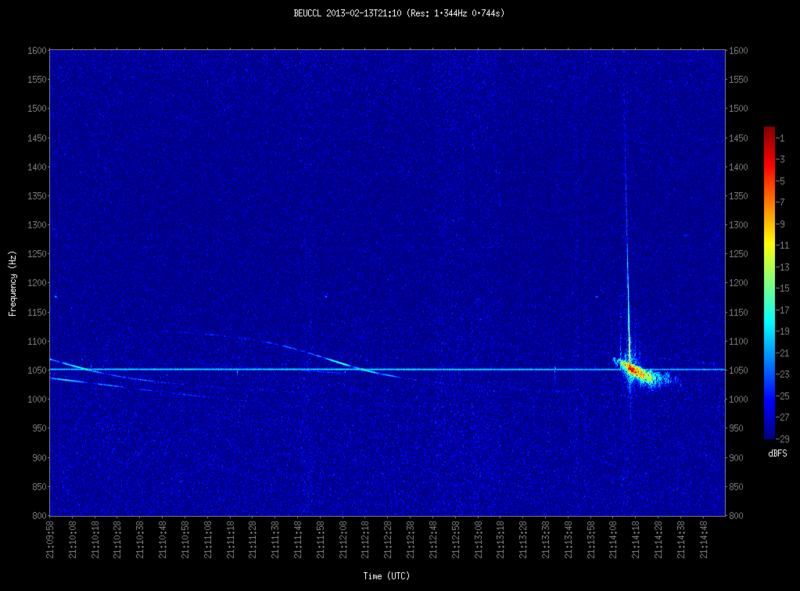 While designed for the detection of meteor echoes, the BRAMS stations are also sensitive to solar flares, at least when their intensity is large enough and/or when the Sun is located within the main lobe of the antenna. 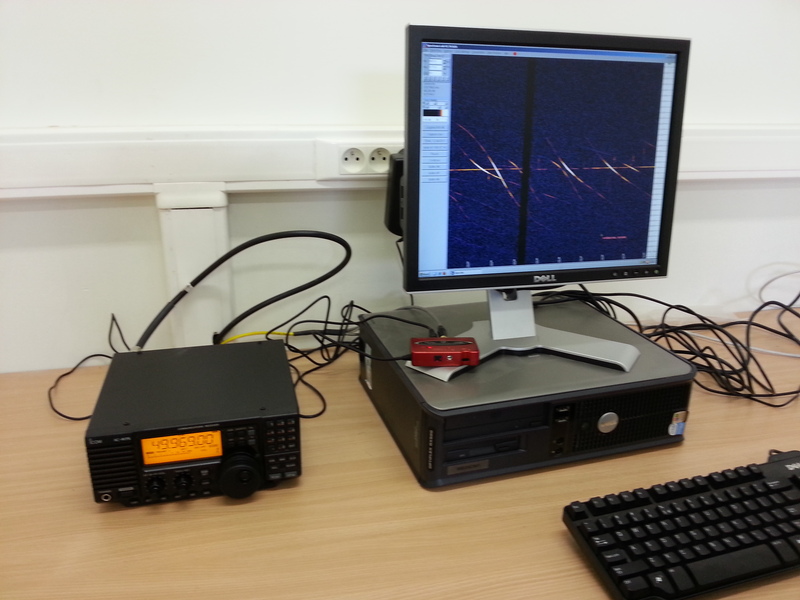 Recently a student from ULB has made an internship at BISA and worked on the detection of solar flares with BRAMS data. 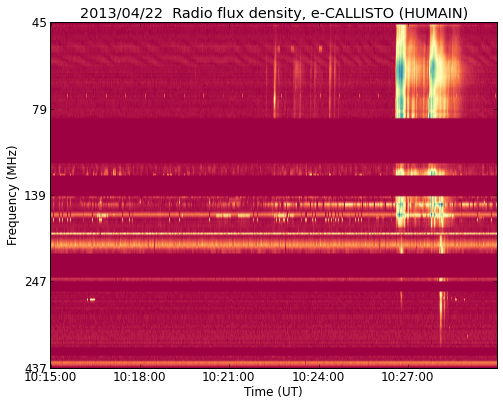 Below is a very recent exemple of solar flare observed at BEUCCL on 22/04/2013 and the corresponding spectrogram observed at Humain by the Callisto spectrograph from the Royal Observatory (see data at www.sidc.be/humain). 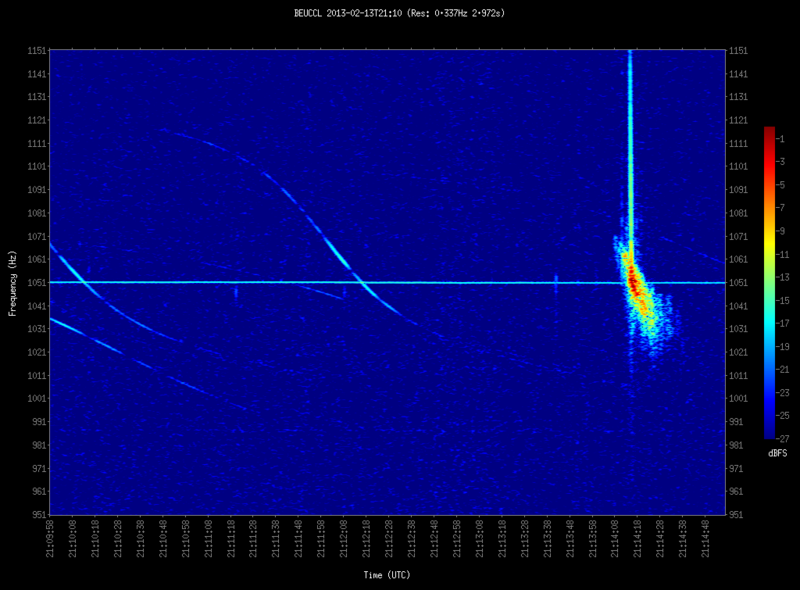 The structure of the solar flare is clearly visible in our BRAMS data. 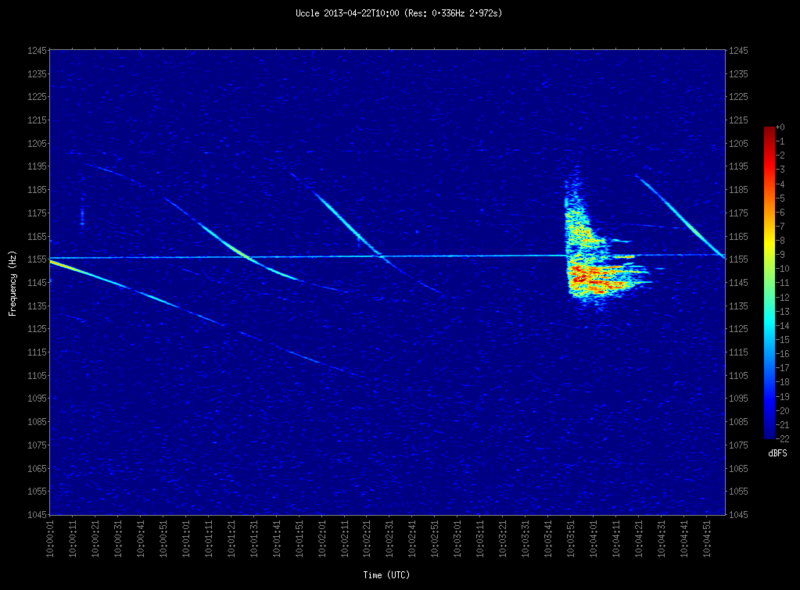 Below are some spectacular echoes observed at BEUCCL during the Lyrids 2013. 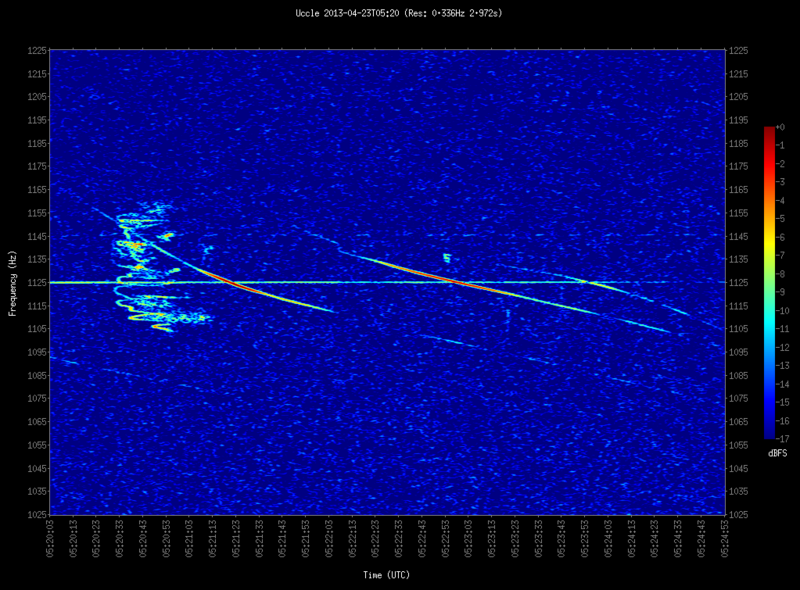 The first spectrogram on the left hand side shows a beautiful "epsilon echo" with multiple branches. On the brightest echo from the spectrogram on the right, a clear head echo can be seen before a long and intense overdense echo. 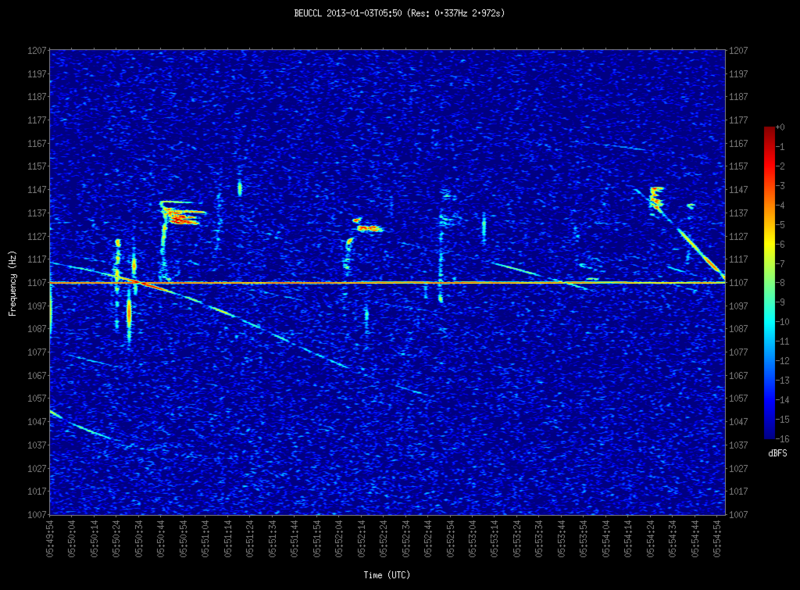 The spectrogram on the 2nd row shows another very bright overdense echo with a complex turbulent structure. 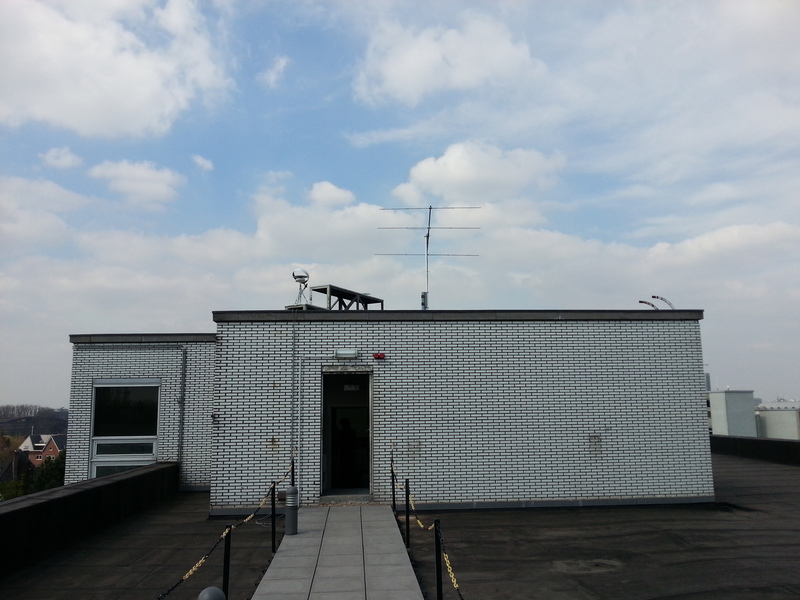 On 22/04/2013, a new BRAMS station has been successfully installed in Gent on the Armand Pien Observatory located on the University campus. 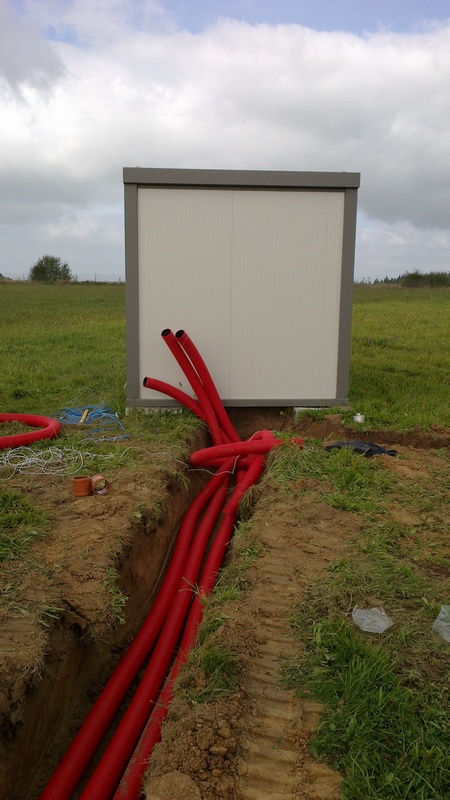 Thanks to Guy Wauters and collaborators for helping us install and to host the BRAMS station. On the right image, the frequency range has been increased to show the "head echo" due to the reflection of radio waves on an ionized region in front of the moving object. 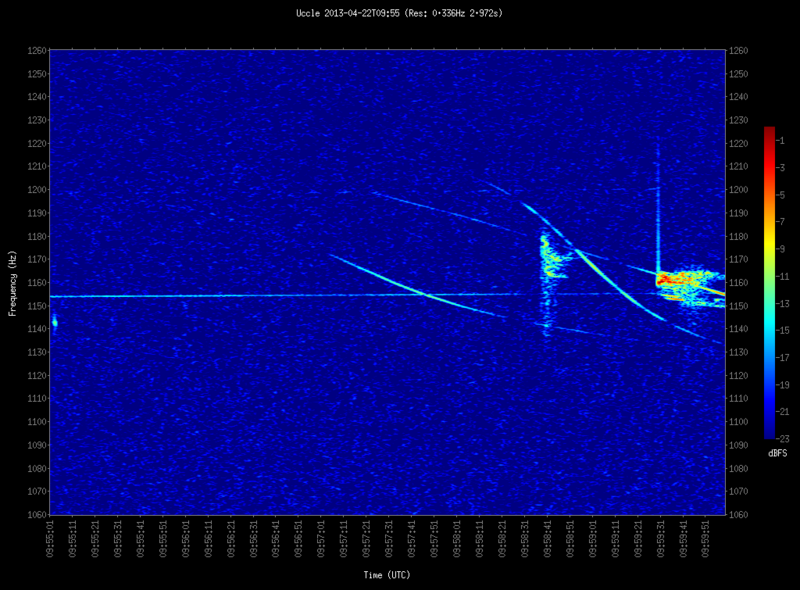 The Soyousz upper stage was moving at around 7 km/s producing a strong Doppler effect visible on the image. 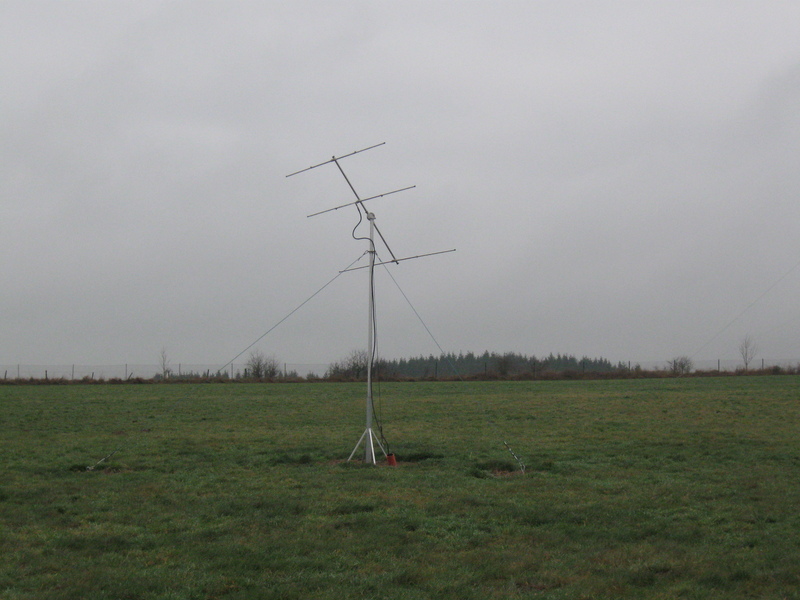 The Humain station will eventually host an interferometric system with 5 antennas. 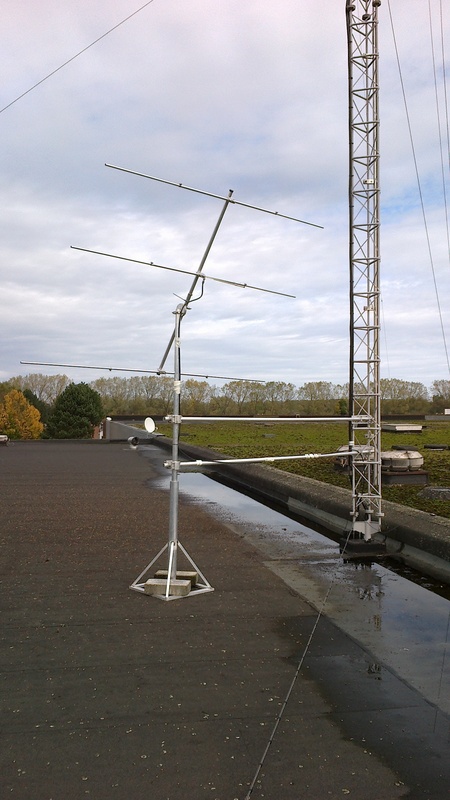 Before everything is ready, we have used the two antennas there for the following test: computer simulations have revealed lately that the radiation pattern of a 3-element Yagi antenna inclined by some angle and located at some height above the ground can be strongly modified by the ground properties (whether it is conductive or not, hence dry or wet for example). This ground effect is strongly reduced if the antenna is directed vertical. 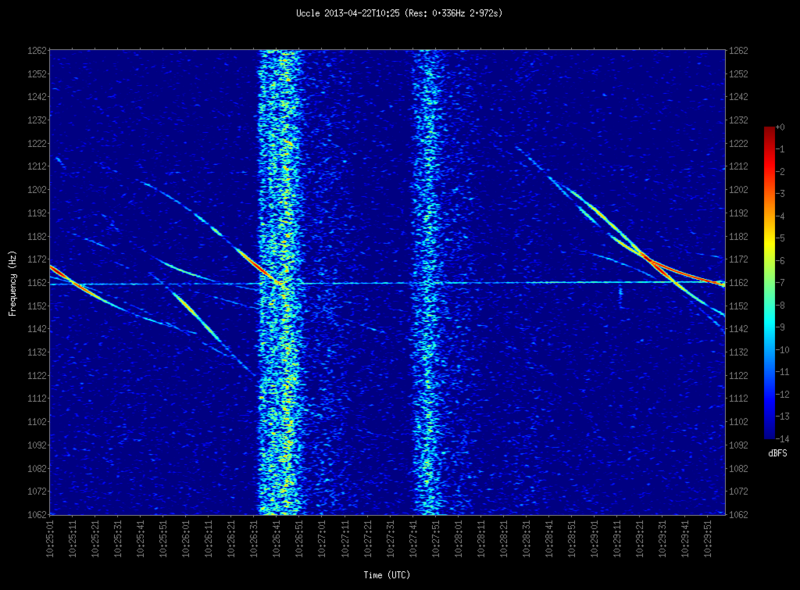 The test currently done in Humain is to compare the number of meteor echoes we receive between an antenna pointing like the other BRAMS antenna (toward a point more or less located at 100 km altitude above the beacon, picture on the left) and an antenna pointing toward the zenith (picture on the right). After a few days of test, we will be able to answer this question quantitatively. The BRAMS team would like to wish everyone a happy & healthy 2013 as well as lots of success in meteor observations. 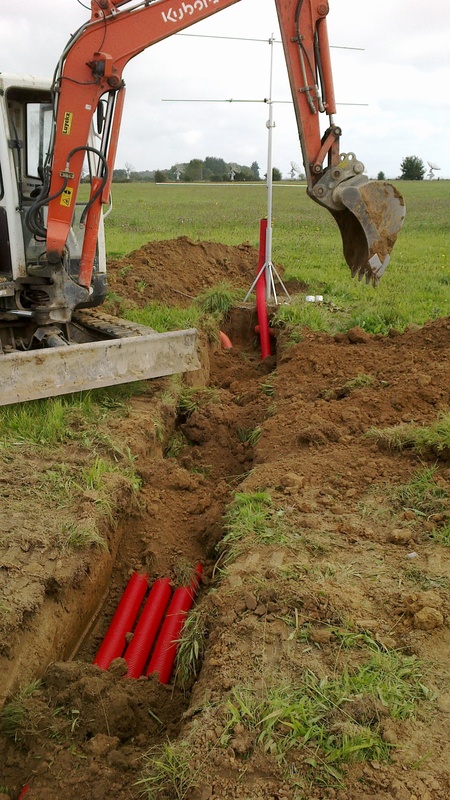 This year we will try to update this website more regularly with recent advances in the BRAMS project. The year started well with a strong activity from the Quadrantids, as captured on the spectrogram below obtained at Uccle at 05:50 UT.